We’re thrilled to reveal a sneak-peek of our 2015 poster, designed by the super-talented Indonesia-born, Melbourne-based designer Nani Puspasari. An energising visual harmony of creativity and Indonesian heritage, this artwork features just a small cross-section of the incredible range of fabric arts found across the country, as well as a traditional Bugis boat, often found plying the waters of the region. 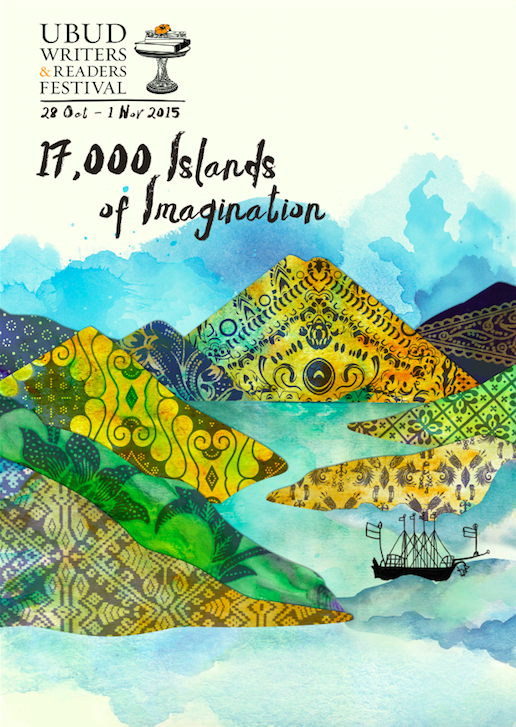 We think it perfectly captures our theme this year: 17,000 Islands of Imagination. This is the theme chosen by the Frankfurt Book Fair for the Guest of Honour Nation and the Festival has elected to present a united front in order to best showcase the rich literature and arts of Indonesia to the world. The theme is suggestive of the extraordinary diversity of the vast archipelago, a country united by creativity and imagination. It will consider the isolation and distance implicit in island living, and the currents of migration, trafficking and slavery that have flowed past these shores. On the 50th anniversary of the 1965 Indonesian anti-communist massacre, we will also reflect on remembrance and reconciliation crossing borders and generations. The figure is vast, the territory covered incredibly diverse. But as with past Ubud Writers & Readers Festivals, our focus is the extraordinary stories and big ideas that shape our lives, creative impulses and shared histories. We look forward to seeing you October 28 – November 1, 2015, and sharing this experience with you.